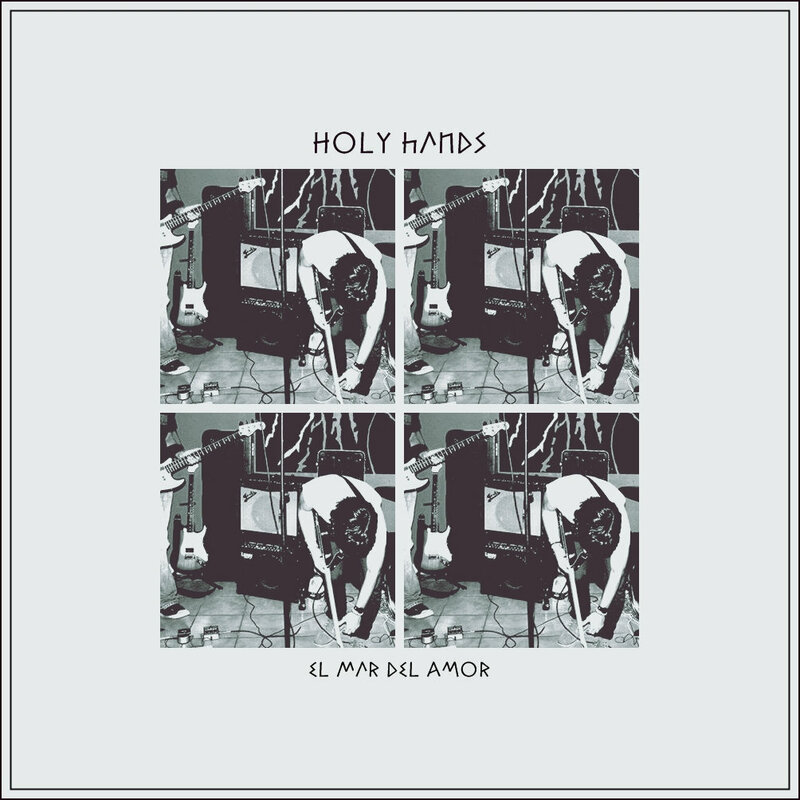 Riot In My Brain : Holy Hands - "El Mar del Amor EP"
Holy Hands - "El Mar del Amor EP"
Holy Hands is a 3-piece post-punk band from Coro, Venezuela. They released their debut album last year, Manifiesto, and have released several free EP's since then. This is their 3rd EP, El Mar del Amo (which translates to The Sea Of Love). And I'm really quite pleased with it, it's definitely their best work so far. The production on this EP sounds vastly improved from their previous releases, and it makes for some great reverb-drenched post-punk/shoegaze tracks. On all of Holy Hands previous recordings, the mixing of the layers and use of reverb didn't add up as well as it does on El Mar del Amor. I'm not sure what the band did to improve their production, but it sounds a lot better on this new EP. But enough technical babble, let's dig into the songs now. The EP starts appropriately with "Hola", a slow building but atmospheric track that is pretty dense with its sound. The guitars are very out-there and are filled with distortion and reverb, and the vocals have this great effect on them that makes it sound like they're going through a telephone speaker that make them sound really unique. The lead singer Moisés Amaya has a very plain, atonal way of singing, that is really benefited by the odd effect put on his vocals here. I just love how it sounds. Next is "Santos", a short track that goes a bit harder and faster than the first track, with some really blood-pumping drums, and shots of feedback coming in through the reverb every once and a while. The reverb on this track is really thick, making the guitars almost incomprehensible, but still enjoyable. "En el Mar" is a fun post-punk jam that reminds me a bit of an early Dirty Beaches track. I could see this track and "Santos" being really fun and loud to see in person. "Duele" is probably the most atmospheric track on the album, with some very thick octave-up guitar sounds surrounding the rest of the instrumentation. It's definitely my favorite track on the EP. It feels developed and emotive in all the right ways. It feels kind of like a Joy Division track, in my opinion. The closing track is appropriately called "El Final", and it's a nice reverb heavy drone without much else to it. It's definitely not bad, I just wish Holy Hands would've done a bit more with it. While I do think the band still could use some improvements to their production and mixing of their sound, as well as maybe some quality control, I'm glad I found these guys, and I'll be looking out for what they do in the future. Holy Hands definitely has some potential, and I think they're worth checking out. Tomates Fritos, La Mar, Dermis Tatú, Charliepapa, Viniloversus, Los Mesoneros, La Vida Bohème, Okills, Famasloop, HolySexyBastards and Del Pez. And I'll be checking them out. I'll check them out as well, n_n. Also n_n, I've heard Polyman, they're great. Good review dude. Have you listened to Dirty Beaches? I find this EP pretty similar to Dirty Beaches. What do you think? By the way, I think the lo-fi idea and that lack of production is something that is part of the project. It defines them. Indeed, I really like that detail and I feel this EP is way darker than the other stuff of Holy Hands. I definitely see the Dirty Beaches comparison. Reminds me of a lot stuff from "Badlands", particularly on the vocals. And I do like the lo-fi production, it makes things interesting and unique. There are moments though where the production really pulls the track down, and it doesn't let the track feel as heavy or as emotive as it could. That's kind of where I have a problem with it. But for the most part, I do think it gives the band their sound. I did talk to the band though, and the lo-fi recording does have a lot to do with budgetary constraints and lack of proper equipment. However, they did improve their sound with some new ideas on recording for this EP. Plus, I think the mixing/mastering has improved on here from their previous stuff. I admire the band for working with they have, I think that's pretty awesome.